sailboat. : Organic Surge Nature's Winter Wonders Bundle: A Christmas Gift Idea! Organic Surge Nature's Winter Wonders Bundle: A Christmas Gift Idea! Providing a top to toe pamper opportunity, the Organic Surge Nature's Winter Wonders bundle would make such a beautiful Christmas gift for someone you love! With 6 products, aimed to give your skin a little extra nourishment & protection from the bitterly cold weather, it's the perfect little bundle to get you through the day while looking forward to a little alone time in the evening - hello relaxation! The bundle includes the Organic Surge Super Intensive Daily Moisturiser, which is an intriguing little product because it is super nourishing but it sinks into the skin instantly, leaving no oily residue at all. The Moisture Boost Shampoo & Moisture Boost Conditioner are a nice duo, I have quite oily hair but they don't leave my hair feeling or looking weighed down, they lather nicely and really help to tame my hair making it look smoother. The Gentle Meadow Body Lotion is my least favourite product from the bundle, but only because I'm not the biggest fan of lavender scents and I certainly can't fault the product itself because I've still been using it every day. It's a really light feeling lotion but it's soothing and hydrating without leaving you feeling sticky or greasy. The Sugared Almond Shower Gel is just amazing, the scent is gorgeous, it's sweet without being too much and I really do feel like my skin is left feeling more moisturised after using this. It's not a scent that lingers very long on the skin, I would love if they made a body lotion with this scent - yummy! Finally, my favourite product from the bundle is the Spiced Lily Foaming Bath. The best way I can describe the scent of this is that it's like a warm fruit bread that you've just taken out of the oven, it's a really warm scent that's not too spicy but it leaves you feeling instantly more relaxed. Organic Surge is a wonderfully affordable brand that prides itself on the use of good quality ingredients that your skin will love. Each product is formulated without parabens, SLS and other harsh chemicals & they're not tested on animals. Not only do the products feel super luxurious and more expensive than they actually are, you can be assured that Organic Surge as a brand work hard to offer help and support to communities who aren't fortunate enough to have everything they need. So not only do you (or someone you love) get to enjoy lovely products, someone's life somewhere else in the world will get a little easier. 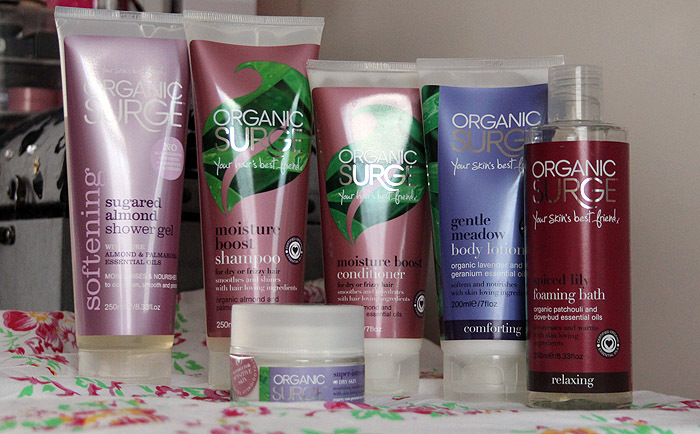 It's a win win, and this year Organic Surge has become one of my all time favourite brands. I like that each product is full sized and they're available individually as well, so if you or the person you're buying for really falls in love with one or two products in particular, they can purchase those whenever they want to! This bundle is currently on sale at £29.95 and if you purchase from the Organic Surge website there's currently free UK delivery on orders over £20. Have you ever tried anything from Organic Surge before? What do you think of this bundle? Oooh this looks like something I need to try! Never tried any of these! Thanks for the reviews hun! very interesting, I've never tried them! December 2012 GlossyBox - Festive Celebrations! Blogmas Day 6 - The Christmas Tag! Make Up Storage: Blogmas Day 5! Hello Blogmas & A Beauty Wish List! Hello December - Blogmas Day 1!